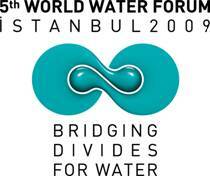 Turkey hosted 5th World Water Forum, in Istanbul, on 16-22 March, 2009. The forum brought together public and private organizations, international organizations, NGOs, research organizations, universites from all over the world to discuss the water issue from many aspects and to take the attention of all stakeholders on the water issue. A number of events and organizations took place during the week. ‘Water and Woman’ workshop was one of these events in which Leyla Arsan, TAGES CEO, participated and made a speech on ‘Water, Innovation, Woman and Sustainability’. Leyla Arsan, TAGES CEO, made a speech in the workshop on Water, Innovation, Woman and Sustainability in the Why Gender Mainstreaming in Water Management? Session. Leyla Arsan pointed out the global problems related to water such as access to new water resources, cleaning of polluted water, better management of waterand global solutions that are required to respond this problem. She took attention to the necessities of innovation like cooperation, sustainability, diversity, creativity, scientific approach which have already existed in women. Therefore, she underlines that for a better innovation in water, woman participation is a value and European funding programmes provides an environment for innovation.